This beautiful specimen of white ash found in the middle of the lawn south of the Kirkland Hall drive is a representitive of a dying species. The invasive emerald ash borer has killed virtually all white ashes north of Tennessee and the insect has been found in Nashville. 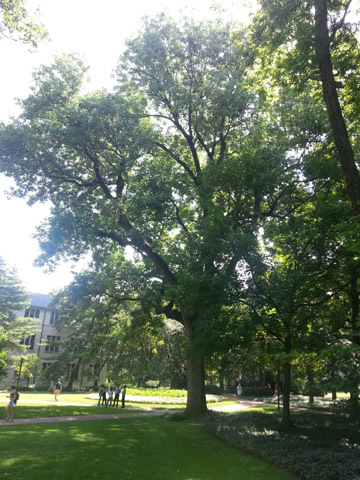 This largest ash is also among the 20 biggest trees overall in the arboretum. It has a diameter of 118 cm (46 in. ), height of 28 m (92 ft.), and crown spread of 25 m (80 ft.). Ash trees are easily recognized by their paddle-shaped fruit, when it is present. However, this particular tree is probably a male and has not been observed to set fruit. To the practiced eye, large ashes can be recognized by their distinctive bark, whose ridges criss-cross. Ash wood is strong and flexible and is used to make all wooden baseball bats. This organism is a living specimen that is part of the  Vanderbilt University Arboretum  with the local identifier 2-638.